I made some fabulous pecan bars for a party on the 4th. One of the things I love about this recipe is it’s like having pecan pie, but doesn’t require as much effort to make or eat. I found this recipe in my Taste of Home baking book and wanted to share it with you. Also, while the recipe is not gluten free as written, it can be easily converted to gluten free by trading out the all-purpose flour for your favorite gluten free alternative. 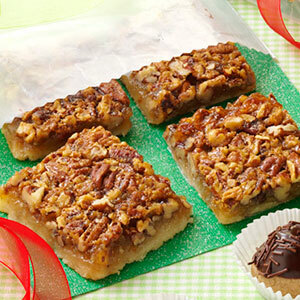 All the flavor of pecan pie in a bar cookie. In a large bowl, mix flour, sugar and salt; cut in cold butter until mixture resembles coarse crumbs. For filling, in a large bowl, whisk eggs, corn syrup, sugar, melted butter and vanilla. Cool completely in pan on a wire rack and cut into bars.